A decision to space out the distinctive triangular chocolate chunks in two Toblerone bars sold in the UK has upset fans who say that they do mind the gap. The product’s makers, US-based Mondelez International, said it had changed the design to reduce the weight of what were 400g and 170g bars. Some consumers have described the move as “the wrong decision” and said the bigger spaces looked “stupid”. Mondelez said the move was down to a rise in the cost of ingredients. 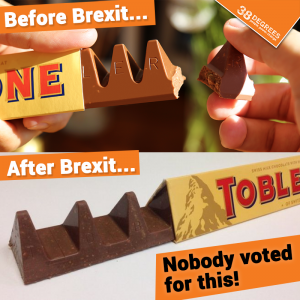 But consumers took to Toblerone’s Facebook page to question why the company had decided to make the gaps between the triangles bigger, rather than reducing the length of the bars. However, she was unable to clarify whether the change in shape affected only bars sold in the UK and not the rest of Europe. ← Labour could block Brexit shambles.